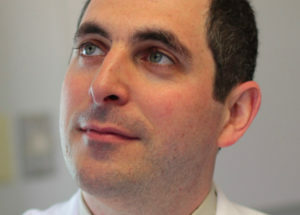 Jonathan Sherman, MD is a neurosurgeon, assistant professor, director of surgical neuro-oncology, and director of stereotactic radiosurgery at The George Washington University School of Medicine & Health Sciences. He obtained his medical degree from the Medical College of Georgia and completed his neurosurgery residency at the University of Virginia. Following completion of residency, he completed a fellowship in surgical neuro-oncology at Memorial Sloan-Kettering Cancer Center. He is a member of the Congress of Neurological Surgeons (CNS), the American Association of Neurological Surgeons (AANS), the Society of Neuro-Oncology (SNO), and the North American Skull Base Society (NASBS). He is actively involved in organized neurosurgery and serves on numerous committees including the CNS Education Committee and the CNS SANS Lifelong Learning Committee. Dr. Sherman has several clinical and research interests in neuro-oncology and has published numerous articles in peer-reviewed journals. His clinical interests include primary and metastatic brain tumors. He also has an interest in the use of stereotactic radiosurgery to treat cranial and spinal tumors, including meningioma, acoustic neuroma, and pituitary tumors. His research interests include the development of clinical trials for novel therapeutics, which include the study of neural stem cells in the origin and treatment of brain tumors, and the use of radiosensitizing agents in post-operative adjuvant management of brain tumors. In addition, he is interested in the diagnosis and management of post-treatment radiation injury for brain tumor patients. Dr. Sherman also treats degenerative spine disease by both minimally invasive and open surgical procedures. Dr. Sherman uses a multi-disciplinary team which is focused on the treatment of neuro-oncology patients with both surgical and non-surgical treatment protocols.